The Explorer window displays the components associated with the currently opened *.epk3 file. Each component can be selected with the mouse to display its contents in the Workspace. 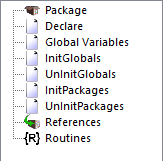 The References and Routines components can be expanded if a reference or a routine exists in the package file. When a reference or a routine is added, the associated component will be expanded by default. A component can be expanded by clicking the "+" next to the component and collapsed by clicking the "-" next to the component. Package Displays the general properties of the .epk3 file itself in the Workspace, including the name, prefix, and version number. Declare Displays a window in the Workspace used to enter DLL calls that will be associated with the .epk3 file when used in E-Prime. GlobalVariables Displays a window in the Workspace used to declare global variables, constants, and user types that will be used by the routines in the *.epk3 file. InitGlobals Displays a window in the Workspace used to enter script that will run prior to any startup info prompts, and prior to the initialization of devices and objects. This component is only for assigning variables like x = 5 and Attributes. It is not to be used to call functions, or performing other operations. UnInitGlobals Displays a window in the Workspace used to enter executable script that will run at the end of the experiment to release any references created in InitGlobals. InitPackages Displays a window in the Workspace used to enter executable script that will run after devices have been initialized but before objects are initialized. UnInitPackages Displays a window in the Workspace used to enter executable script that will run at the end of the experiment to release any references created in InitPackages. References Any *.epk3 files that are referenced by the currently opened PackageEditor File will be listed under the References component. Routines Any routines that are associated with the currently opened PackageEditor File will be listed under the Routines component.